LOS ANGELES -- When Mike Smith and the guys in front of him are working together well, that end of the ice becomes a frustrating fortress for opposing teams to penetrate. That was the case Sunday, as the Phoenix Coyotes shut down the Los Angeles Kings to avoid elimination in Game 4 of the Western Conference Final in a 2-0 win at Staples Center. Smith made 36 saves, while the skaters in white in front of him did their part to keep most of those attempts from being good scoring opportunities. "Our guys have hung around the game. That's why we've been successful in the playoffs," Phoenix coach Dave Tippett said. "Smith makes big saves when he has to. The rest of our team competes hard in front of him. We give ourselves a chance to win." Added Smith: "I knew it had to be my best game of the series. Obviously, we can't afford to lose that game. So it was important to obviously have a good start, get in the game early with some saves. Kind of just rolled from there." Los Angeles has controlled this series in part because of the Kings' relentless pressure in the Coyotes' zone. The Kings are bigger, and they have been able to lean on the Coyotes with forechecking pressure to cause turnovers and chances and eventually, goals. The script looked pretty similar in the first period Sunday. Los Angeles outshot Phoenix and had several quality opportunities. Smith made a couple of key saves, and as the game progressed the Coyotes' defense started to gain control. Eventually the shots started coming from farther away, and Smith had relatively easy stops to make after Phoenix grabbed a one-goal and then a two-tally advantage. Even in the third period when the Kings attempted 31 shots, only 13 reached Smith and most were pretty harmless. "Depends where those shots are coming from," Tippett said. "If they're coming from outside, that's one thing. If they're coming from right in the guts of the ice, that's another. We didn't give up near as many chances tonight as we gave up earlier. "The bend, don't break -- we have to play a certain way if we're going to have success. It starts with competing, you know, blocking shots, things like that. If there's outside shots, a lot of dumped pucks to get to Mike Smith, we'll deal with those. Those aren't scoring chances." Part of Smith's plan to frustrate opposing teams is making important saves, but he also likes to play the puck a lot and it can be a weapon for the Coyotes. Teams like the Kings that want to forecheck with multiple forwards can be slowed by a goaltender who controls the puck when it is dumped into the zone and can help keep his defensemen out of danger by making an accurate outlet pass. Smith likes to play the puck as much as possible, and as this game progressed he had it on his stick more and more. The result was fewer long shifts in the Phoenix zone for the Kings, and more time away from the pressure for the Coyotes. "I think there was one play in the third period with about nine minutes left -- [they] soft dumped it in past the defensemen -- Smith went all the way to the boards, chipped it out," Phoenix captain Shane Doan said. "We were able to get the puck and have some pressure down in their zone. It's literally like having an extra defenseman out there. "It's a safety blanket maybe we count on sometimes too much. But he's the best in the League at it. I mean, when he gets the puck, us forwards, if he misses you up ice, it's like, 'Come on, Smith, what's going on, you didn't see me?' It's unbelievable that you would even ever have that cross your mind as a forward, but he's literally that good. We all are very grateful and enjoy it and take it for granted at times." The Coyotes have lost six times this postseason. Three times, Smith has responded with a shutout. Games 2 and 3 of this series against Los Angeles were the only two contests after a defeat he hasn't won. Smith also continued his streak of games with at least a .900 save percentage. He's been at that mark or higher in every postseason game for the Coyotes, and his run dates back to a March 18 victory against Edmonton -- a span of 24 contests. That game began a 7-0-2 closing kick by the Coyotes to earn a postseason berth and claim the Pacific Division title. 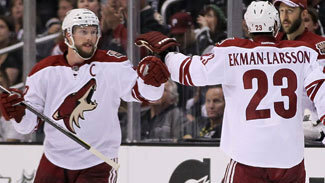 "You know what, it's funny, every game, when we need a big game from Smith, he's been absolutely amazing," Doan said. "At the end of every game, I always kind of remind him about how unbelievable he is when we need a big game. "In the first period, the reason we come out of that period 1-0 is because of him. As a team, I think we gain so much confidence from him. I think all of a sudden it's like, 'Smith's on, we're going to win.' That's I think a big thing. But you can't say enough about how in every single time we've needed a big game out of him, you don't want to say the 'S' word, but he always throws it out there and it's been unbelievable." Unlike many goaltenders, Smith isn't superstitious. He had no problem clarifying Doan's statement.